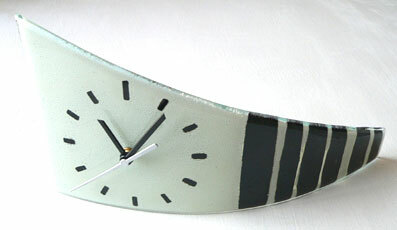 Stunning handmade fusion glass/wall table clock. Set in an eye catching black and creamy off white stripes design on one side of the clock and black digits. Contemporary curved design allowing you to set on a table. Height ranges from 17-3cm and it is a long 34cm. This clock is handmade and to a high design quality, sure to draw comments from everyone who sees it!